It has finally dawned on me the exact meaning of the ridiculous slogan of Barry's McChangington Express. "Change" is never defined, but is always there. This means that NOTHING he says or does can be taken at face value, it is always going to change. Barry says, "You can always rest assured that everything is going to change. Nothing is etched in stone in this campaign. No belief is too devout as to prohibit any change in that belief. My core values are always subject to yield to the person with the greatest amount of power that can be delivered into my lair and to be handed to my loving wife, who will put that power in the freezer with my nuts." He has torn a page from the George H.W. Bush playbook, and used it to his own advantage while securing the support of a bunch of ill informed morons under that wing of his. He has perverted our language so stupid people cannot even understand what he is saying and will vote for him, much to their own detriment. 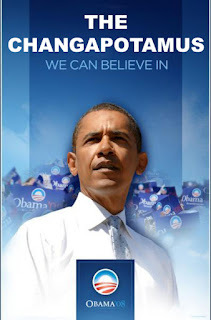 "Change we can believe in" is the new "Read my lips, no NEW taxes." Make your own "Believe In" poster HERE.